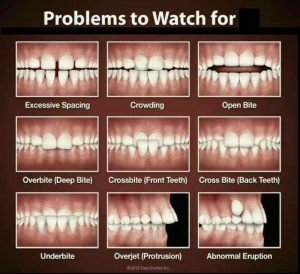 Orthodontic issues often arise when adult teeth start coming through, and it’s very important to get onto these problems early. A dentist can typically tell when a child might need braces, or else they can become necessary later in life when misaligned teeth start posing a threat to overall dental health. Here are some of the signs that a trip to a dentist in Frankston for braces may be necessary. You can tell a lot about your teeth from your bite. Bite problems suggest a problem with your jaw position, which can show signs of both noticeable and subtle problems. Issues with your bite need to be fixed, as an incorrect bite can cause damage to teeth, leading to decay, tooth loss and more. If you suspect you have problems with your bite, book in with a dentist in Frankston to have the problem looked at. One of the biggest signs that your teeth are aligned incorrectly is problems with speech and chewing. Teeth that are incorrectly positioned can often lead to poor communication skills like speech impediments and lisps. It’s also likely that you’ll find it difficult to eat and chew your food. Fortunately, visiting a dentist early on for braces can help you avoid having to go to a Frankston dental hospital when eating becomes too painful or difficult. Crowded, misplaced and blocked-out teeth are all examples of teeth being incorrectly aligned. Letting your teeth become overcrowded can lead to problems like decay and tooth loss, which can be costly and frustrating to fix later in life. If you have misaligned teeth that could potentially be pushing other teeth out, it’s important to get the problem assessed by a dentist in Frankston to determine if braces are necessary. Signature Smile Studio is dedicated to providing patients with a high-quality level of dental care. If you suspect you might need braces, make an appointment with us today.